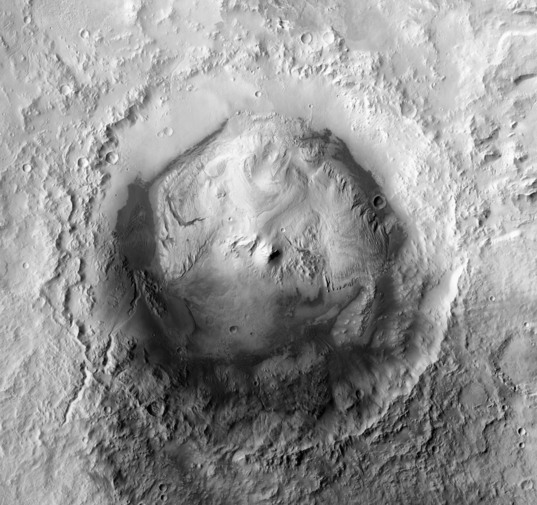 The news leaked a few weeks ago has turned out to be true: the next Mars rover, Curiosity, will be headed for Gale crater on Mars when it launches at the end of this year. I had no particular horse in this race -- I'm just glad that the selection has finally been made! I'm now writing an article on the selection process for the next issue of The Planetary Report (join the Planetary Society now if you'd like to receive this lovely magazine), and have collected links to lots of useful background information on the selection, which I've posted below. Plus, I got an email from Tanya Harrison sharing with me this awesome Mars Reconnaissance Orbiter Context Camera mosaic covering all of Gale crater that she put together "just for fun," she says. My kind of fun! Youtube video narrated by project scientist John Grotzinger with 3D flyover of landing site, pointing out areas of scientific interest and likely rover traverse route. I embedded this video below the crater photo for your convenience. There are also several fine (silent) flyovers by Doug Ellison, Adrian Lark, and Christopher Haley/Dawn Sumner. Follow links to related videos for many more. NASA Ames' landing site selection website links to lots of useful resources, including DTMs of landing sites; see also the workshop presentations from Day 2 of the last landing site selection meeting for in-depth looks at science and possible traverse routes. Particularly nice "big picture" perspectives are this one and this one from Ken Edgett (big PDF files). Here's a near wind model by Aymeric Spiga. In addition to the nice overview image below (which is at a resolution of 100 meters per pixel when fully enlarged), Tanya also shared with me a closer zoom onto the northwestern part of Gale where Curiosity will land and then drive at 10 meters per pixel. You can download it either with or without a scale bar superimposed; both are about 14 MB. 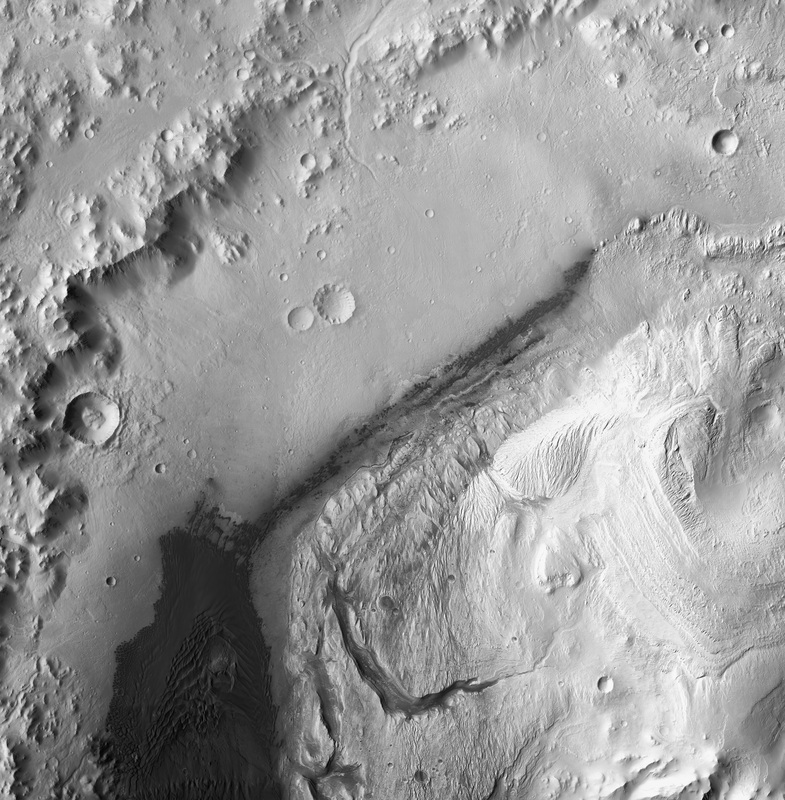 A mosaic of Mars Reconnaissance Orbiter Context Camera images covering all of Gale Crater. 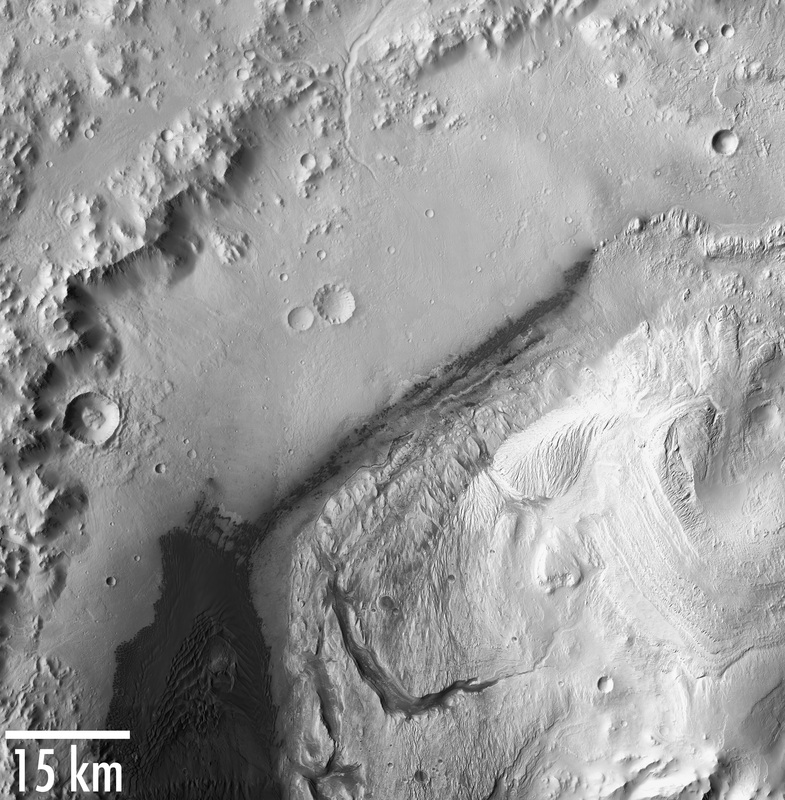 The whole crater is about 150 kilometers in diameter.